Data. It’s tempting to simply think of it as the content that is displayed and distributed on AV systems that isn’t video. Several trends are coming together and increasing the value and need for data driven design in collaboration spaces and control rooms; the rapid access to unfathomable amounts of data, the increase in focus on remote collaboration, and the influx of interactive touch displays. Technology has evolved to duplicate this type of work process including software that emulates the use and manipulation of sticky notes, white boarding, and other activities that reflect how knowledge workers collaborate in non-technological ways. The remaining question is how data facilitate these processes and how the technology can further enhance the use of data. With regards to designing collaboration spaces or control rooms, this means planning ahead for data to be a tool to be utilized in the space, not just other content. The first step is ensuring the displays and the backbone of the video distribution system are equipped to handle data. The effective use of data, however, goes beyond the displaying of it. The design implications include understanding what data will be required in the space, where that data going to come from, how participants connect and access it, and how participants share their own data from their own device. The design and implementation of available technology is significantly more effective when these factors are considered early in the process. Another element in data visualization is the use of data outside of static data used for decision making and collaboration. 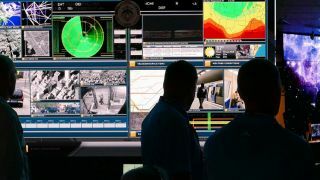 In control room applications, data can mean real time information that is part of managing and operating a process. Manufacturing control rooms will need to access productivity and uptime statistics. Industrial drilling control rooms monitor environmental conditions, equipment conditions and telemetry, and other safety data in real time. Intensive Care facilities feature telemetry stations for monitoring patients. These are just a few examples in which data is the critical content and drives the design of the room and the technology implemented. Data is everywhere. That kind of ubiquity can lead to a casual attitude towards the access and display of data in our collaborative spaces and control rooms. If virtually any data can be accessed in the palm of the hand in moments, then certainly a technologically equipped room can access it as well. The power of intentional data driven design is bigger than that and can unlock more effective and profitable decision making, as well as the real-time management of data driven processes. AV Technology magazine's technical advisor, Justin O'Connor, has spent nearly 20 years as a product manager, bringing many hit products to the professional AV industry. He earned his Bachelor’s degree in Music Engineering Technology from the Frost School of Music at The University of Miami. Follow him at @JOCAudioPro. Subscribe today for The Agile Control Room newsletter sponsored by RGB Spectrum (distributed twice per month, every other Tuesday).